In an age where weekends are precious, the last thing you want to be doing is spending all day looking for the tools you need in order to get those DIY tasks done, or the backyard tennis set you put away last summer and can’t find. 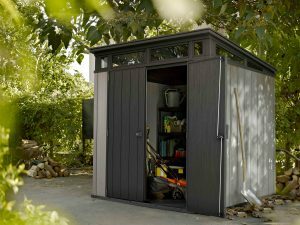 Organising your garden shed properly ensures you have easy access to your tools and stored items, plus it will actually increase your capacity when you store smart – a win win! 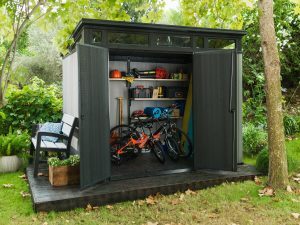 Put up some shelving -Shelving is a great way to organise your garden shed. Group similar items together and ensure that any electrical goods are not too close to the floor. Good quality, robust shelving can hold approx 20 – 25kg per shelf. Adding shelves instantly increases storage surface area – an ideal solution to a messy, disorganised shed. 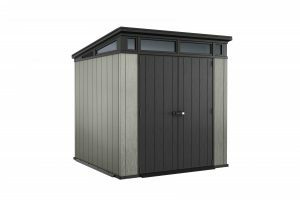 Make your shed seasonal with clearly labelled containers – It can be very handy to have camping and snow gear stored at the front of the shed in autumn and winter, and rotate containers in spring and summer with your DIY, gardening, pool items. Invest in sturdy containers and don’t forget to label them! Make good use of the wall space – Use tool hangers to hang shovels and spades to prevent them from getting wet during heavy rain, which can rust metal surfaces. A peg board secured to the wall is an ideal way to store small tools – you free up more space and they’re much easier to find! Free up the floor for large items. Think mower, whipper snipper, blower, bikes. You want to be able to get these items in and out easily, not having to move the entire contents of the shed from in front of them first. 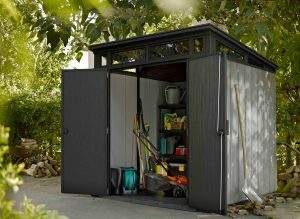 You’ll love your shed even more when its organised. Images are of our Artisan 7×7 and Artisan 9×7 sheds.